Spot showing model joining a peace march ignites outrage online. People might not want to "live for now" after watching Pepsi’s new ad starring Kendall Jenner. In fact, the masses took to social media on Tuesday night to call it tone-deaf, claiming the use of the "Keeping up With the Kardashian" star as a mediator during a protest trivializes police brutality and social justice movements. Part of the brand’s "Live For Now" campaign, the commercial was created by PepsiCo’s in-house content creation arm Creators League and launched Tuesday morning. In the 2:39 spot, Jenner is in the middle of a modeling shoot. But as peaceful protestors march by with signs reading "Join the Conversation," Jenner joins in and marches towards the front of the pack, picking up a Pepsi as she does. 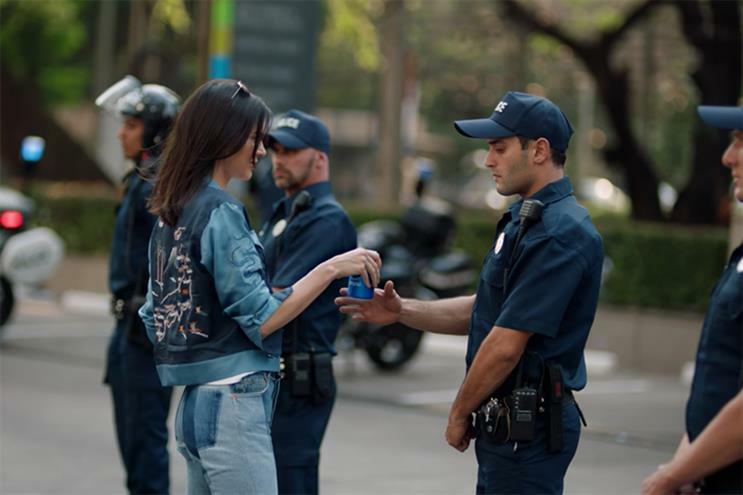 Coming out of the throngs of protestors, Jenner approaches a police officer and offers him the ice-cold Pepsi. The crowd cheers as he sips it and smiles. The tagline at the end reads, "Live Bolder, Live Stronger, Live For Now." The whole thing is set against the politically-charged song "Lions" by Skip Marley. By 7 p.m. ET, "Pepsi" became the top trending topic on Twitter and "Kendall" followed with more than 62,000 tweets. Consumers expressed their disgust for the spot on social, noting that it achieves a new level of tone-deafness with the scenario of Jenner—a white, wealthy (not to mention famous) American—bridging the divide between white male police and protestors. If Kendall Jenner was Black the police would've thought the Pepsi can was a weapon & Dr. Pepper®-sprayed her in the eyes for resisting. Others drew comparisons of the closing shot of Jenner offering an officer a Pepsi to the now famous photograph of nurse Ieshia Evans, when she stood in front of combat officers this past July in Baton Rouge at a Black Lives Matter protest. Mochama writes, "If only she’d given them a Pepsi." The comparison is even stronger considering that a photographer in the commercial takes a photo of Jenner at that exact moment. Critics also questioned the brand’s choice of Jenner because the protest theme doesn’t align with the model's values. One commenter on the YouTube video threw shade at the ad by writing, "Kendal Jenner saves the day although she has never spoken out on social injustices, yet she is the key piece to ending the resistance!" Some media outlets such as AdAge, Daily News and US Weekly bypassed the commercial’s disputed themes, and focused instead on the fact that Kendall appears as a blondie in the commercial. That is, until she throws off her wig to join the resistance. It’s clear the brand was eagerly trying to appeal to millennials who have come out in droves to support causes in The Women’s March and Black Lives Matter protests. When the ad debuted Tuesday morning, Pepsi said in a statement that the ad "captures the spirit and actions of those people that jump into every moment. It features multiple lives, stories and emotional connections that show passion, joy, unbound and uninhibited moments. No matter the occasion, big or small, these are the moments that make us feel alive." And why not add in a celebrity—which the brand has done in countless other campaigns—to the mix? After all, it doesn’t hurt that Jenner, who is the first model to have her own global advertising campaign for the brand since Cindy Crawford in 1992, has 77.8 million Instagram followers. Pepsi has not replied to comment since the backlash broke out. However, on Tuesday afternoon, Brad Jakeman, president of Global Beverage Group at PepsiCo, tweeted that he was "proud" of the work.